Hopes were raised by the duo of Rohan Bopanna and Divij Sharan, who had won the first match of the day to much fanfare. It seemed a repeat of the famous 3-2 win against China last year was unfolding right in front of the spectator’s eyes. However, Prajnesh Gunneswaran was unsuccessful in pulling off another upset against Italy’s Andreas Seppi on Saturday as India were eliminated from the Davis Cup after losing the knockout World Group Qualifiers 3-1. 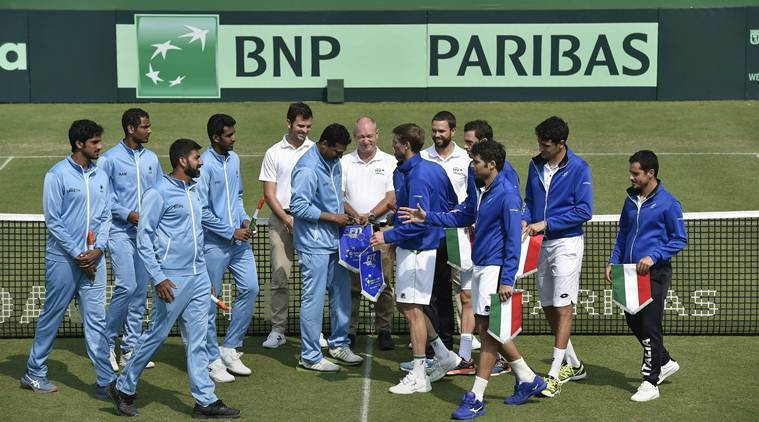 India had their best go at making the cut, having convinced the Cup officials to compete the Qualifiers at the grass court of Calcutta South Club against the clay-loving Italy. However, their historical struggle in the singles hit them hard once again. India’s top singles player Prajnesh Gunneswaran was up against visitor’s most experienced player in Seppi. Nonetheless, the Italian was always going to be to match too good for the Indian. Prajnesh regularly struggled to withhold his serve against Seppi, with the latter’s abilities at full display. The Indian had a very nervy start to the first game, a thing that marred his performances throughout the set. Moreover, his place was laced with a number of unforced errors, with the pressure from Seppi to hard to handle. Two things, Seppi’s experience, and 29-year-old’s shot choice were what let him down. The Italian was dominant throughout and raced his way to an easy 6-1 win in the first set. Although Prajnesh put up a great fightback in the second set, it was already too late. Seppi eventually won the second set 6-4 and thus the tie for Italy. Earlier in the first day of the Davis Cup tie yesterday, Prajnesh was defeated by Matteo Berrettini in sets of 4-6, 3-6 whereas Ramkumar Ramanathan bowed out after a 4-6, 2-6 game against Seppi with Italy taking the honours. The only positive for India in the tie was the doubles department. Bopanna and Sharan exhibited great resilience and courage to come from behind under intense pressure to beat the Italian duo of Simone Bolelli and Berrettini. With Prajnesh’s disappointing loss, the inconsequential final tie between Ramkumar Ramanathan and Matteo Bernetti was not played. Italy will now move into the Davis Cup Finals whereas India will once again be left with the huge challenge of resurrecting the singles. Moreover, India’s non-playing captain, Mahesh Bhupathi’s future will also be hanging in balance.